As per my plan, I had pre-ordered my breakfast room service which came right on time. Took my shower, ate breakfast, watched a little CNN, then went downstairs to the tournament. I timed the walk and it’s about 7 minutes, but I wanted to get there a little early just to be safe. They were not letting people in yet when I got there and there was a flood of players and spectators, and media in the hall, getting ready to enter. When I got to the Rio on the first day, I checked out where my table was so I would know how to get there quickly. When the doors opened, I think I was the first one at my table. A player I met at a live game at the MGM was supposed to be at a table nearby but his table was moved to the ESPN featured table with Chris Moneymaker. I guess I’ll see him on TV, and I’ll get to see if he bluffed me out of a big pot or if he had it. The only player I recognized was Rafe “Tiltboy” Furst, who unfortunately for me, was sitting to my immediate left. After waiting a few minutes, the tournament director made the announcement, and we started playing. We are starting with a whopping 20,000 in chips. Each round is 2 hours long. The blinds started at 50-100 with no antes. One of my few big hands was when everybody limped in and I was on the button with 6-3 offsuit. Normally, I would muck but it was so early and nobody seemed to want to pop things up for a steal. The big blind was an older gentleman that was playing super conservative. So I limp also with my horrible hand. The flop is A 6 3. Nice. But with everybody in the pot, somebody could easily have A-6 or A-3. Everyone checked to me. I wanted to get rid of anybody with a wheel draw so I bet out fairly aggressively. Everyone folded except for an Irish guy in seat 5. He flat calls me. I didn’t like that but I was hoping he had ace rag. The turn was a Q. No change for me. I didn’t put the Irish guy on A-Q so I figured nothing changed. He checked and I bet yet again. The Irish guy called again. I hope I’m not going to get knocked out this early. The river was the magical 6 for me. I rivered a boat. The Irish guy checks yet again. I figured I’ll bet and he’ll fold quickly. I bet out 3,000. The Irish guy goes into the tank. He finally wakes up and asks, “You have a boat?” Interesting question. Normally, I would not answer but I nodded my head to make him think I was lying. He says, “Well, I have a boat too. I call.” Whaaat? He has a boat too? Oh crap! Luckily, he flips over pocket 3s and shows 3’s full of 6s versus my 6’s full of 3s. I thought I was winning the whole time and instead, I had sucked out on the river. I think Rafe said he had a 6. If so, it was a one outer, about 2%. Lucky baby! Rather be lucky than good. That put the Irish guy on tilt and Rafe was no longer the tiltboy of the table. The Irish guy pretty much just had 2 moves. Fold or all-in, after his bad beat. I finish round 1 with 33,150. After the supposed 20 minute break, which was more like 30 minutes, we continue round 2. I finish round 2 with 34,725. So far so good. Just kept playing good hands and stole a blind or 2, here and there. In round 3, I got A-K under the gun (first to act after the big blind). A truck driver named Buzz-dog came into the pot. He was playing super tight so I didn’t like this at all. Maybe he came in because I kept stealing his blinds and maybe he got tired of it. The big blind also comes in. Not good. The flop is A-Q-7. The big blind comes out swinging with 2,000. I have to get rid of any draw so I pop it up to 6,000. Buzz-dog thinks for a while and goes all-in. Big blind goes all-in. I don’t have to think too long. I’m all out, after losing my 6,000 raise to the pot. They flip over their hands and the big blind as A-7, and Buzz-dog has A-Q. What a crazy flop! I’m glad I only lost 6,000. That hand put a hurt on me, but I still end this round with 39,725. We go for dinner break at 7:05pm and when I get up to my room, the room service guy is knocking at the door. Perfect timing. I eat my dinner and relax for a bit before going back downstairs. After resuming play, I end round 4 with 42,925. In round 5, Rafe Furst is getting low on chips and is pushing way too hard to steal blinds. I noticed that so I limp from the small blind with no callers at all. I had K-2 <heart> and normally, I would raise there but I know he’s going all-in and I can’t call that. He wants to see the flop and checks. The flop has king high and so I pair my king. I check knowing full well, Rafe is going to bet out. I’m hoping he goes all-in. But he just bets 2,000, and I check-raise him and he folds. So Rafe, if you are reading this, I didn’t make a great play on you. I had the king. Not much after that, Rafe goes all-in and gets knocked out of the tournament. Players are starting to drop like flies now. They are getting low on chips and are making big moves. The Irish guy goes all in with pocket 10s and gets called by pocket 7s. Not sure about calling there with pocket 7s but I can see why he did that because the Irish guy was doing it too much. The pocket 10s hold up and yet another guy goes away. On one hand, I tried to steal the blinds with 10-6 offsuit but the big blind calls me with A-10. The 10 flops but it’s all <club> . The big blind came from another table and has aobut 80,000 in chips. He check calls me. The turn brings a blank and I bet out 15,000 and he check calls me again. After the river, I give up and show my hand and lose a bunch of chips. Now, I’m below my original 20,000. Now I know I have to double up before the night is over. A guy raises and I look down at A-K. I really need to get some chips so I make a crazy overbet and go all-in for 18,000 or something like that. He thinks a bit and calls. Crap. I didn’t want that. He shows pocket 10s, so it’s a race for my tournament life. I flop the ace and he doesn’t improve so I double up. Nice. I really needed that. Now, I’m back up to almost 40,000, where I was a while ago. I end round 5 at 43,700. Round 6 was rough for me. First, we change tables. That was not good because I had established a good table image and now I don’t know anybody at the new table and they don’t know me. There are 2 low chip stacks at the table, which made stealing nearly impossible. I had to wait for a hand which never came. I had one opportunity to try to steal but a guy had limped under the gun. Very dangerous. But being pretty desparate for chips, I raised and sure enough, he called. He checked the flop, I bet and he check-raised me. Of course. Oh well, I lose a bunch of chips there. Nothing else really happened except I got blinded down to 32,300. Not good considering the average chip stack is 51,000. It’s 4am. I’m spent. I’ve never felt so tired after a poker game before. There’s going to be 2 day 2s this year. My day 2 will be on Wednesday. 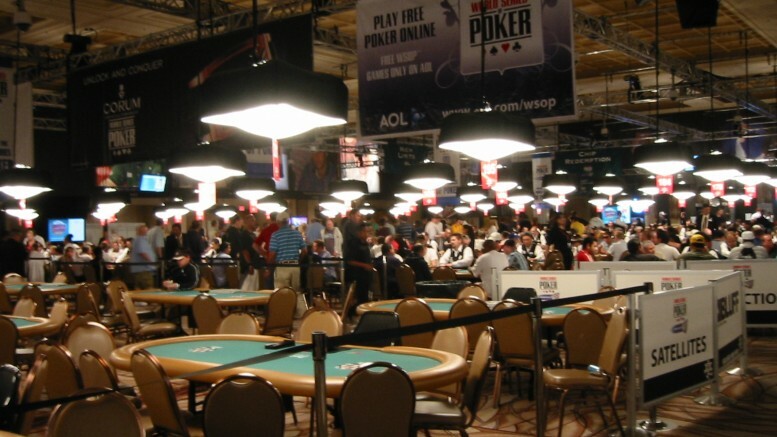 Be the first to comment on "WSOP 2007 – Day 1"